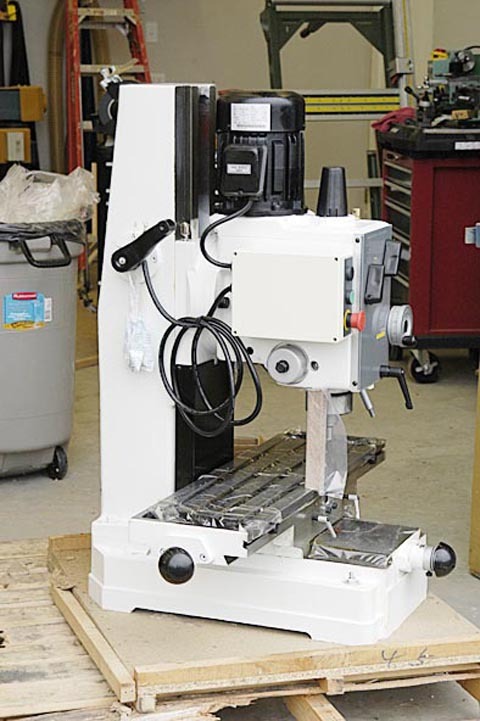 Rong Fu 45N2F Drill Press / Benchtop Milling Machine - the ultimate alternative to a "Plain Jane" drill press. This is a Rong Fu 45. The Rong Fu is the originator of the "benchtop" Mill/Drill category of machines, and is made in Taiwan. 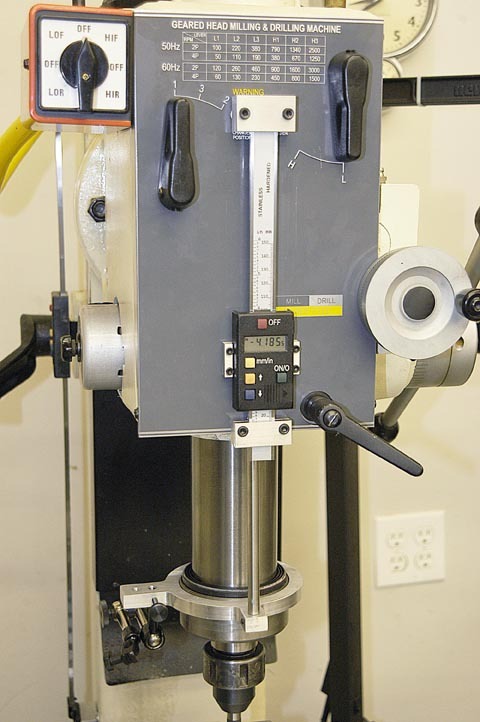 The model 45 has a square column which keeps the head in XY alignment when it is cranked up or down so you don't loose your XY position when changing tooling. The unit weighs about 700 pounds, is available in single and three phase versions. The head is gear-box driven (no belts) and has a 5"+ quill stroke. 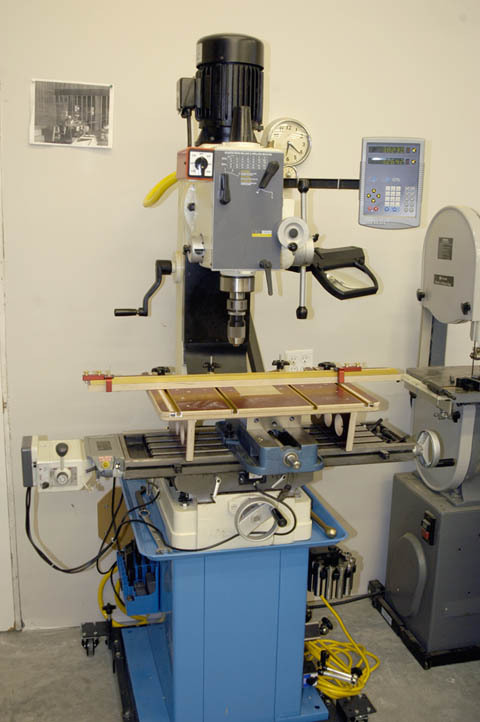 The XY table has an envelope of about 9.5" X 20" and the head takes R-8 tooling (same as a Bridgeport). Power down-feed is an option from some suppliers in the US. The head will also rotate to a horizontal position (or any angle in between). There are a number of Chinese knock-offs of this machine sold by Harbor Freight, Grizzly, Enco and others. I wanted a quality unit and stuck with the Rong Fu brand and I'm glad I did. Many of the knock-off machines have different and more restricted specifications (quill depth and XY table envelope principally), and some have round columns and Morse Taper instead of R-8 Quill. Investigate before you buy. My primary application for this machine is as a quality drill press - mostly for woodworking. But I have also enjoyed the ability to do metal milling projects with it as well. This shows the setup in my shop. I have rigged it with a "woodworking" drill press table that drops into the Kurt 6" machinist vise. I have outfitted the machine with a Newall DRO for the XY table, power-feed for the X (long) direction, and a quick release tool system. I bought this machine from Penn Tools because they offered a version with two speed reversible motor, in addition to the wide speed selections available with the gearbox. Speed range of this 45-N2F model is 60 to 3,000 RPM forward or reverse (tapping ability) and it has 3 power down-feed speeds as well. This photo shows my shop-made DRO for the Z axis - there is one DRO on the head with a 20 inch stroke, and another on the quill with 5+ inch stroke. This is a fine quality workhorse of a machine - very robust and excellent quality. Additional details of the DRO installation can be found by clicking here.